But three strands of West Indian beads. Pink. Blue. Rainbow. Desiccated seeds. All-American head to toe—even unmentionables. In the ‘hood. But within. A bright Black shout. It was summer. Not winter. Hope. Not doubt. 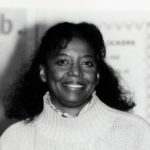 First poetry editor of pioneer feminist magazines, Aphra and Ms., Yvonne received poetry awards including from NEA (1974, 1984) and from Leeway (2003) for fiction (as Yvonne Chism-Peace). Some anthologies featuring her poems are: 161 One-Minute Monologues from Literature, This Sporting Life, Catholic Girls, Tangled Vines, Celebrations: A New Anthology of Black American Poetry, We Become New, Bosque Press #8, and Pushcart. In-progress is a verse memoir of her ‘Fifties youth.